adidas made big waves at their launch event for the new ‘Telstar’ World Cup ball in Moscow last week. The star players invited to the event were all wearing a previously unreleased football and UltraBoost mixture, which adidas today officially unveil. Check it and the two accompanying colourways out here. The adidas event in Moscow saw lots of newly released, old and future products all gathered in one place. To present the new Telstar-football adidas had invited some of the world’s most iconic World Cup winners, including Zinedine Zidane, Lukas Podolski, Xabi Alonso, Kaka and Del Piero. They all turned up to the event wearing the ‘Multi’ colourway of A 16+ PureControl UltraBoost, which until now had not been officially unveiled. The Limited Collection adidas A 16+ UltraBoost ‘Multi’ is constructed from the yarn of some of the most iconic UltraBoost releases from adidas football over the last two years. It is the ultimate mashup of the immensely popular silhouette from adidas and celebrates the most successful fashion/football combination ever designed. 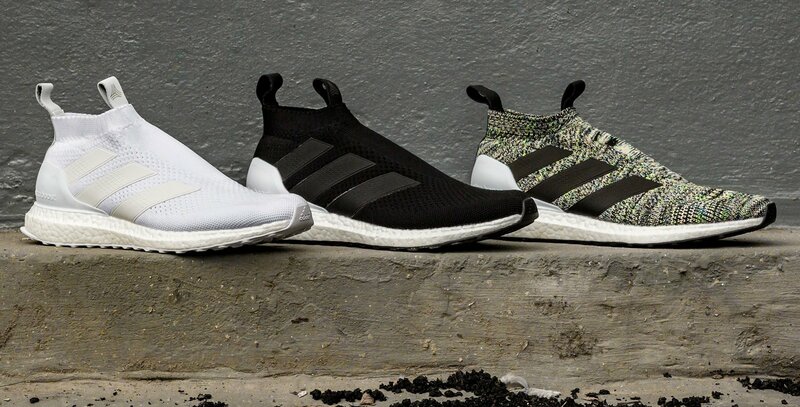 Surprisingly, the ‘Multi’ colourway, which we definitely expected to see hit the shelves, is also accompanied by a further two A 16+ UltraBoost colourways. The two more classic looks are similar to previously released version, but still feature tango detailing on the pull loop to reveal that they are V2. You can order your pair of adidas A 16+ UltraBoost through this link. Hurry, because they will be gone today!